In order to get my Macintosh SE connected to the network via Ethernet, I bough a cheap Dove Fastnet Ethernet card from eBay. 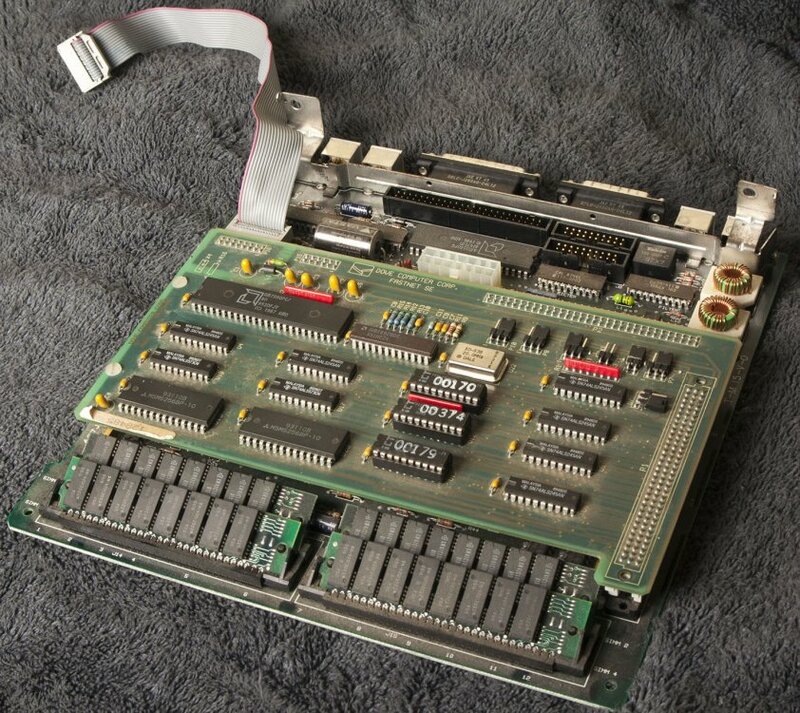 Like most PDS Ethernet card for compact Macintoshes, this card consist of two boards, the “big” board that is connected to the Macintosh SE motherboard and the “small” that is connected to the back of the Macintosh with the AUI and BNC ports. Most of the electronics and processing logic are on the “big” board, whereas the “small” board contains mostly Ethernet transceivers (such as the AM7996) for the AUI and BNC ports. Unfortunately, all my attempts to get the card to work on a Macintosh SE failed. Simply put, there was no driver available anywhere on the Internet for this card! From my research, the card was manufactured by Dove Computer Corporation whose main business is network/telecommunication equipments and belonged to a family of similar NIC cards for 68k Macintoshes. The FastNet SEn is for the Mac SE whereas the FastNet SE/30s is for the SE/30. The manufacturer (Dove) is no longer in business, but a text file that describes the company’s range of product can be found on archive.org. I found an old Usenet discussion here which mentions dove-fastnet-3-amd.hqx (or Dove FastNetIII.800K.sit.hqx) and dove-fastnet-3n-nat.hqx (or Dove FastNetIIIn.800K.sit.hqx) being the drivers for the FastNET III cards with the AMD and National chipsets respectively, but these files cannot be found anywhere online. At one point (around May 1993) these files were posted to the newsgroup com.sys.mac.digest and available on the InfoMac archive. The current archive does not contain these files, nor does the 1994 CD-ROM release of the archive. From what I found out, the files were posted to comm/net in the archive, which was probably renamed to comm/inet later, with many files deleted or moved elsewhere. The same Usenet discussion also contains a reply from a Dove support personnel on 9 Jan 1993 saying that drivers for other Dove products were also available on their BBS as well as AppleLink. If it helps, when playing with the card, I noticed something really odd. Since the card does not have an RJ45 port, I used a Cisco MAU to convert the built in AUI port to RJ45 and realized that the power LED on the MAU did not lit up! After checking that all connections were secured, I realized that the ribbon cable between the NIC processor board and the connector board might have been connected in reverse. 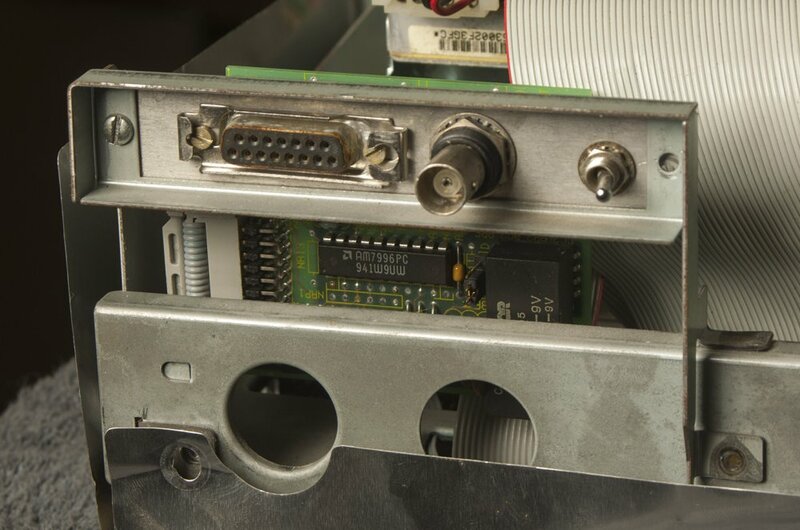 Pin 1 of the connector on the processor board (indicated by the red stripe) does not go to pin 1 of the connector on the NIC board, but instead goes to the other end. This is perhaps the reason why the Cisco MAU power LED did not lit up since it was not receiving power as the cable was wrongly connected. The cable is keyed from factory so it would only fit in one way. What makes this strange is that another member on 68kmla forum with the same card also had the same observation. The only logical explanation would be that Dove used the same set of cable for multiple products, changed the keyed pin (which was just a small piece of plastic) and did not bother to check that the keyed cable actually matched the PCB printout as well as pin 1 red stripe on the ribbon, which sounds unlikely. I did not dare to reverse the cable to verify whether it was indeed keyed incorrectly, fearing I may destroy my motherboard. I simply disconnected the card from my SE and threw it into my junkbox. Maybe one day someone will be able to verify whether the cable was indeed keyed wrongly, and if yes, whether the card would work with Apple’s standard NIC driver should the cable be reversed. The fact that the Cisco MAU’s power LED did not lit up was an indicator that the connector board was not receiving power, which could really be because the cable was connected in reverse. A copy of the Usenet discussion mentioned above can be found here for those who are interested.